Considered one of the best art-knife carvers today, Stephen Olszewskiâ€™s work often depicts a story â€” like this Temptation of Adam and Eve. In the Garden of Paradise, represented by a Swallow flying amongst the foliage, the serpent subtly entices Eve to offer the forbidden fruit of an Apple to Adam. Stephen portrays the Apple as a 18K Gold-mounted Garnet, for the subtle automatic blade-release. Press the Apple, and a Flaming Sword emerges to guard the Tree of Life. 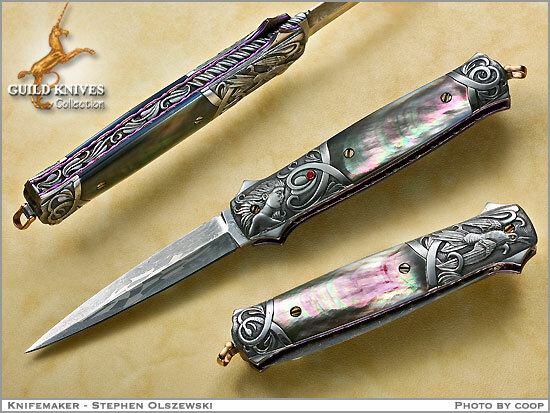 The Black lip Mother-of-Pearl handle is framed, by a guard and rear bolster of Rados Turkish Twist Damascus, beautifully-carved. Titanium liners enclose the floral carving on the backspine. 18K Gold screws and lanyard, plus very smooth auto action complete this classic sculpture!